CoO is a metallic colouring oxide that produces blue in glazes at all temperatures (unless in very high percentages where it will be black). Black Cobalt Oxide is a key source of CoO used in glazes, glass, and enamels. Cobalt is the most powerful ceramic colorant and it is stable in most systems, it appears in many recipes at 1% or lower. Like copper, it melts very actively in oxidation. If it is mixed into a fluid frit base in high enough a percentage, it will completely crystallize during cooling. 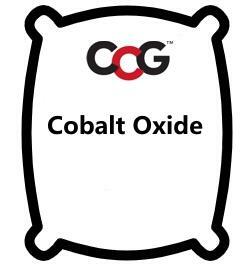 Cobalt is also useful as a body and slip stain (see the oxide CoO oxide for more information). However, cobalt materials are very expensive, this severely limits its practical use in many things. Commercial ceramic grades of cobalt oxide will often produce glaze specking if not thoroughly sieved or ball milled (depending on whether the particles are a product of agglomeration or are simply unground). Cobalt carbonate tends to disperse better in glazes to give even blue colouration because it is not as powerful and can produce some glaze blistering problems (as already notes). Consider a cobalt blue stain for the most consistent and reliable results. The theoretical carbonate form has 63% CoO while this has 93%. So if you want to switch from the oxide to the carbonate in a recipe, multiply by 93 and divide by 63. To switch from carbonate to oxide multiply by 63 and divide by 93. But remember that this will be approximate (for the reasons discussed above), you will likely need to fine tune the amount based on fired results. In addition, the quality of the colour may be different.